The New College Haldane Society are pleased to invite New College medics to its annual dinner at New College on Saturday 11 May 2019. The evening will begin with a drinks reception at 6.30pm in The Founder's Library followed by dinner (3-courses, wine included with the meal) which will be served at 7.15pm. The cost of the dinner is £60.00 per person. If you would like to book your place, please could you use the online booking facility here. Alternatively, you can call the Development Office directly on 01865 279509, where we can take payment via a debit/credit card. We regret that we cannot offer parking on the day but if you have a mobility problem please tell us and we will find a space in college. The Society, named after the celebrated geneticist and physiological alumnus of New College - JBS Haldane, is the in-house society for medical and biomedical students, both past and present. 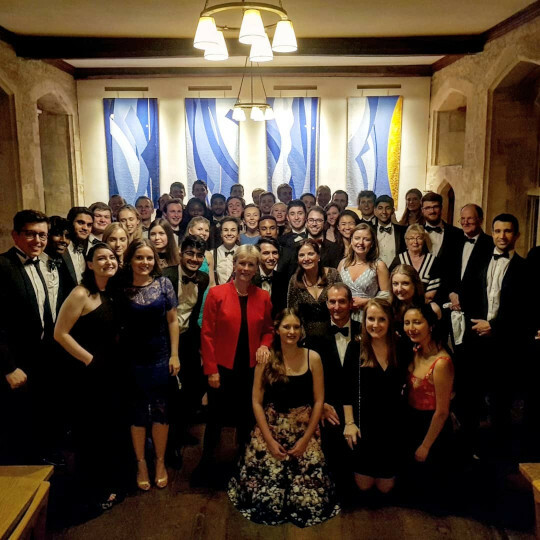 It aims to create a strong community amongst undergraduates, clinical students and fellows by organising social events, such as this annual black-tie dinner and talks from invited speakers throughout the year. The picture below is of attendees at the 2018 dinner.